Or was all of this done in a secret Nevada CIA base? The Moon, a source of both X-rays and gamma-rays. A Funny Thing Happened on the Way to the Moon. Recently discovered forgotten, unedited footage (dated three days into the flight) showing the Apollo 11 crew falsifying part of their photography! Soviet Cosmonaut Yuri Gagarin was never in Space reports that demonstrate Soviet Cosmonaut Yuri Gagarin was never in space—a cosmic lie with which the CIA was fully aware. Russia Continues to Surpass Americans in the Space Race, a letter from Mr. Mark Farrell to the editor of Pravda. NASA exposes their Apollo Moon landing Hoax! It is not possible to fly to the Moon and back because rocket engines cannot lift the amount of fuel required. 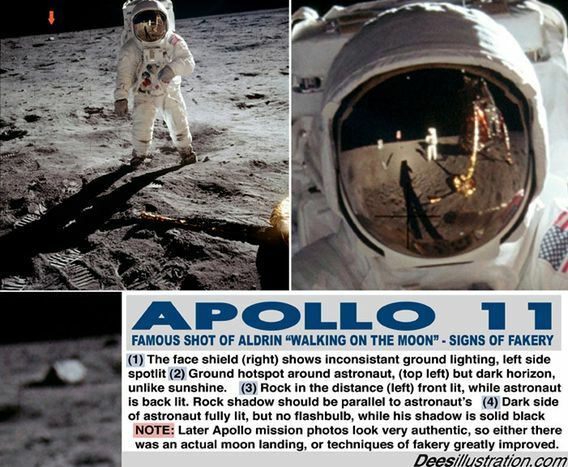 A professional photographer writes: The first thing that made me suspicious of the alleged Moon Landing were the Photos. To me they were BAD Fakes. . . I used a Hasselblad camera for many years. The Astronauts had their Hasselblads fixed to their chest and those helmets made it impossible to bend their heads to look into the viewfinder. I believe their cameras did NOT have viewfinders, so HOW did they focus? They had NO lightmeter so HOW did they measure the light? With those thick gloves HOW did they adjust the F-Stop and shutterspeed? HOW did they change films? Kodak film, in a Hasselblad camera, like those worn by the phony 'moon-walkers,' begins to melt at 150oF. Heat is infra-red radiation and will expose the sensitive film, as it did when we left our cameras in cars years ago. Most meat is well done at 160oF, and there were NO air conditioner units mounted on the cameras (or anywhere else) to combat 273oF heat, so NO pictures could be brought back to analyze their fraud. WHY is it when on TV News programmes, when two journalists are talking, say one in Canberra one in Sydney, that because of the distance there is a TIME-LAPSE when answering questions, BUT in discussions between the MOON and HOUSTON there was NO TIME LAPSE? HOW is it that the moon's surface is supposedly very dry like the sand on the beach yet their boots left SHARP imprints in the sand? Their little Rover threw up clouds of sand when it drove around BUT on the landing pads of their landing rocket there was NO sand . . . . ALSO, their lander stood upright on legs and facing the sky so HOW did the astronauts get that Buggy OUT of their landing module? Here are 33 points that need to be answered! 1) Sceptics argue that the lack of stars on Moon photographs is acceptable, despite zero atmosphere to obscure the view. Yuri Gagarin, pronounced the stars to be "astonishingly brilliant." See the official NASA pictures above that I have reproduced that show 'stars' in the sky, as viewed from the lunar surface. And why exactly do you think there are hardly any stars visible on Apollo films taken from the Moon? The answer is simple—Professional astronomers would quickly calculate that the configuration and distances of star formations were incorrect and so NASA had to remove them to make sure they could keep up the scam. 3) There should have been a substantial crater blasted out under the LM's 10,000 pound thrust rocket. Sceptics would have you believe that the engines only had the power to blow the dust from underneath the LM as it landed. 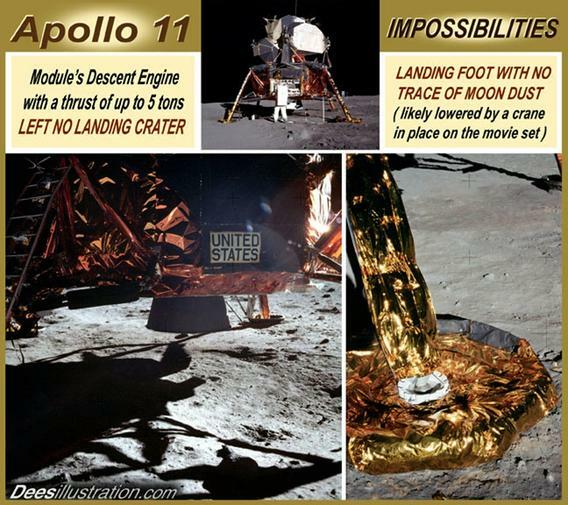 If this is true, how did Armstrong create that famous boot print if all the dust had been blown away? 4) Sceptics claim that you cannot produce a flame in a vacuum because of the lack of oxygen. So how come footage showing flame coming from the exhaust of an Apollo lander? (Either the sceptics are wrong or the footage shows the lander working in an atmosphere). 5) Footprints are the result of weight displacing air or moisture from between particles of dirt, dust, or sand. Armstrong called it powder. Astronauts left distinct footprints all over the place. 6) The Apollo 11 TV pictures were poor, yet the broadcast quality magically became fine on the five subsequent missions. 8) Why did so many NASA Moonscape photos have non parallel shadows? sceptics will tell you because there is two sources of light on the Moon—the Sun and the Earth . . . . That maybe the case, but the shadows would still fall in the same direction, not two or three different angles and Earth shine would have no effect during the bright lunar day (the time at which the Apollo was on the Moon). 11) In Ron Howard's 1995 science fiction movie, Apollo 13, astronauts lose electrical power and begin worrying about freezing to death. In reality, of course, the relentless bombardment of the Sun's rays would rapidly have overheated the vehicle to lethal temperatures with no atmosphere into which to dump the heat build up. 25) In 1998, the Space Shuttle flew to one of its highest altitudes ever, three hundred and fifty miles, hundreds of miles below merely the beginning of the Van Allen Radiation Belts. Inside of their shielding, superior to that which the Apollo astronauts possessed, the shuttle astronauts reported being able to "see" the radiation with their eyes closed penetrating their shielding as well as the retinas of their closed eyes. For a dental x-ray on Earth which lasts 1/100th of a second we wear a 1/4 inch lead vest. Imagine what it would be like to endure several hours of radiation that you can see with your eyes closed from hundreds of miles away with 1/8 of an inch of aluminium shielding! (Are We Trapped on Earth? Impossible Journey). The Solar Wind is the major source of ionizing radiation which strikes Earth's TWO protective shields, the magnetic field and the Van Allen Belt. This extends from 500 miles above Earth's surface to over 100,000 miles into space. Space orbiters must stay well below 500 miles beneath the VAB due to high radiation trapped there that will even damage equipment. The Solar Wind is an extension of the Corona, a 'soup' of deadly ionizing radiation. The major types of radiation particles in the Solar Wind are protons, alpha particles, and electrons (beta) traveling at the speed of light and contributing the VELOCITY of the Solar Wind. Solar flare activity, massive major nuclear explosions on the surface of the Sun, increase the Solar Wind, raising radiation to levels powerful enough to affect power grids on Earth. Scientists believe that the solar wind has stripped away the original atmosphere of Mars, hence there is no life on Mars. 27) CNN issued the following report, "The radiation belts surrounding Earth may be more dangerous for astronauts than previously believed (like when they supposedly went through them thirty years ago to reach the Moon). The phenomenon known as the 'Van Allen Belts' can spawn (newly discovered) 'Killer Electrons' that can dramatically affect the astronauts' health."